Campbell Hall Viking Robotics Team 580 qualifies for FIRST® Championship in Houston, TX, April 18-21 after competing in the Ventura Regional March 29-31. 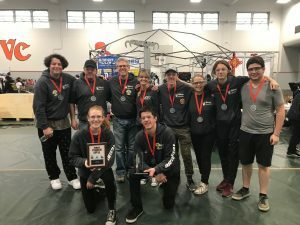 Team 580 came into the Ventura Regional very optimistic, after ranking 17th out of 54 teams at the LA Regional, March 14-17 and joining the 8th seeded alliance to compete in the Quarterfinals, however they did not advance. After the LA Regional, Team 580’s programming team, led by senior Ethan M. ’18, felt confident that the robot, named KEFFLER 9000, could consistently cross the autonomous line and place a cube on the switch during autonomous mode. 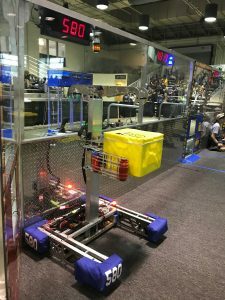 During the teleoperated period, the drive team, led by seniors Justin G. ’18 and team Captain Maddy R. ’18, were confidently driving the robot, moving as many as 9 cubes into the vault to their human player, sophomore Ian W. ’20, who knew the best strategic times to play the power ups. The one component of the robot that really impressed everyone is the climb. 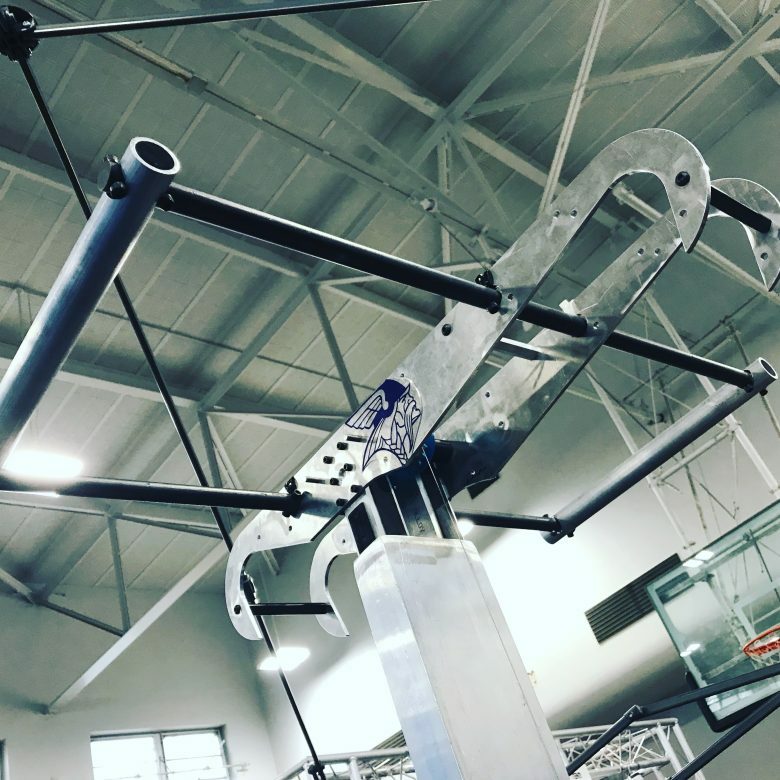 While super loud, the climber, driven by a steel lead screw, topped with a menacing claw, would extend during the last seconds of the match and consistently grab the rung lifting the robot 1 to 2 feet off the ground. 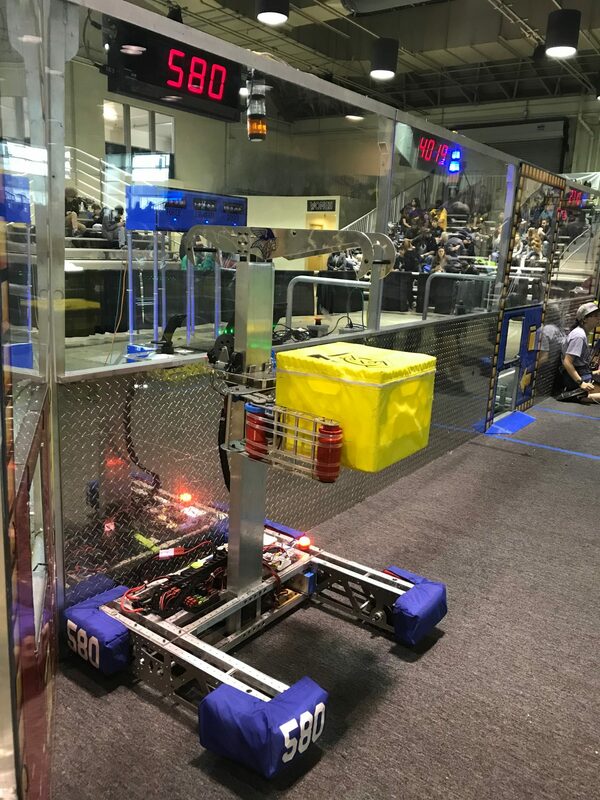 The main thing the team wanted to try to do between the LA Regional and Ventura Regional was create a buddy bar, so that another team could attempt to attach themselves to the robot during the endgame and get additional ranking points. The robot weighed in at 109.4 Lbs, 10.6 Lbs under the 120 maximum limit so there was room to add material. The team designed a buddy bar using two 32″ by 3/4″ steel rods with two 15″ by 1.25″ aluminum tubing and cut two holes in the claw so the bars could attach. While the team was concerned mostly with perfecting the autonomous and driving, Ian W. ’20, got the buddy bars ready to attach when the time came to add them to the robot. Congratulations Team 5818, 3512 and 5515 on a great Finals match. Good luck in Houston. As our alliance captain Team 5199 earned an opportunity to go to the championship and Team 580 was awarded a wild card spot to go to the Championship in Houston. Congratulations Team 580 and good luck in Houston!! !